Football Manager 2018 is rocking the lives of many virtual managers. Some have been sacked, some have already led their team to glory and some of them are still waiting around twiddling their thumbs waiting to see which team suits their revolutionary Libero inspired Strikerless tactic best. Others want to become a 1-0 to Arsenal sort of boring side that grinds out results consistently (I know, Arsenal and consistent were a thing once). No matter where the slightly crazy football maniacs place themselves on the spectrum of style- all of them are universally interested in the best youth prospects coming out their club at the moment. 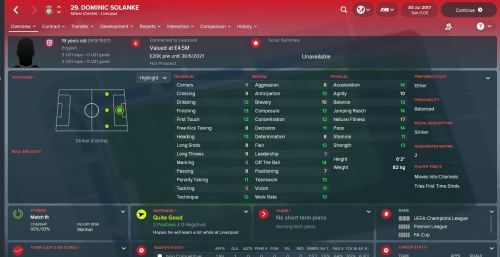 In many ways it is quite fortunate the Football Manager 2018 is so vast and so accurate with a history of projecting future superstars or else these men and women who toil so hard would never be able to inspire the next generation with their tales of having beaten Real Madrid at the Hawthorns in an epic Champions League final in 2029 with Rhian Brewster. In this list, we take a look at which Liverpool U-21 stars have the best chance of fitting straight into your team and could become world beaters with a bit of nurturing. One thing to take note of here is that the players being looked at here are all available straight away in the first season of the game and are not out on loan. The Chelsea Academy product made a lot of headlines after impressing viewers in the Under-20 World Cup held this summer. One of the key architects of England's victory, Solanke has been rated highly at Chelsea since his U-16 days. He was sent on loan to feeder Club Vitesse in the Eredivise where he impressed in 25 games for the Dutch side in the league, scoring seven goals. He returned to Chelsea only to be largely restricted to the U-23 side and not given a senior team run and rejected a chance to go out on loan. He was involved in the matchday squad for an EFL Cup game but was not given any time on the pitch. There were rumours about Solanke failing to agree terms at Chelsea. He let his Chelsea contract run out and instead joined Liverpool in the hope of first-team opportunities. He has played six times in the league already for the Reds. A technically sound player, Solanke is incredibly fit and possesses good pace and strength for his age. Composed when faced with crucial decisions, he could improve massively in the future. He is an England U-21 international and his style of play allows chances to be created around him and is a very useful support striker already. The only downside is his rather weak determination which could be spiced up with a decent tutor.